Horton.--Mrs. Emma M. INGELS, 75, Wetmore, died of an apparent heart attack here Wednesday at the home of a son, Merle Ingels. She was born May 14, 1890, at Netawaka, the daughter of Hans and Henrietta CHRISTENSEN. She spent most of her life in the Netawaka and Wetmore communites. A son, Lloyd C. Ingels, died of an apparent heart attack Monday while working on his farm near Wetmore. Mrs. Ingels is survived by a son, Merle Ingels, Horton; a sister, Mrs. Earl CARSON, California; four brothers, George CHRISTENSEN, Atxell, Edward Christensen, Whiting, Theodore Christensen, Netawka, and Leslie Christensen, Texas, two grandchildren, and three great-grandchildren. 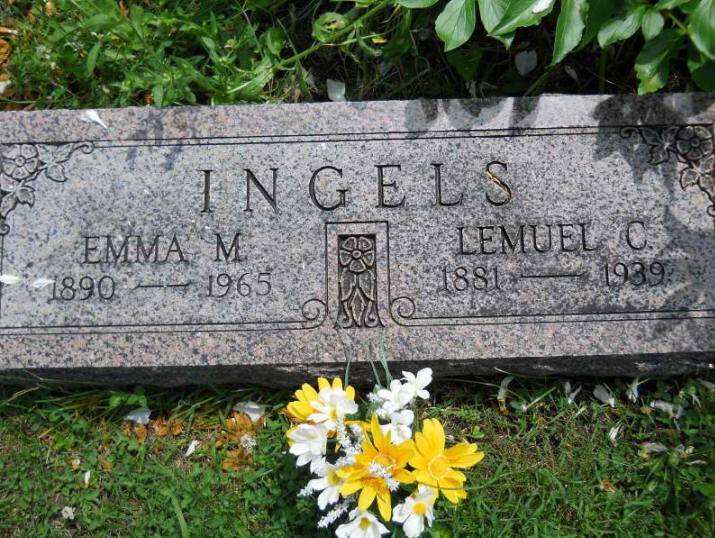 Double services for Mrs. Emma Ingels and Lloyd C. Ingels will be at 2 p.m. Friday at Chaney Mortuary at Horton. Burial will be in Netawaka Cemetery.